Having been vegetarian and then vegan for many years I have tried several different main dishes for Christmas lunch. 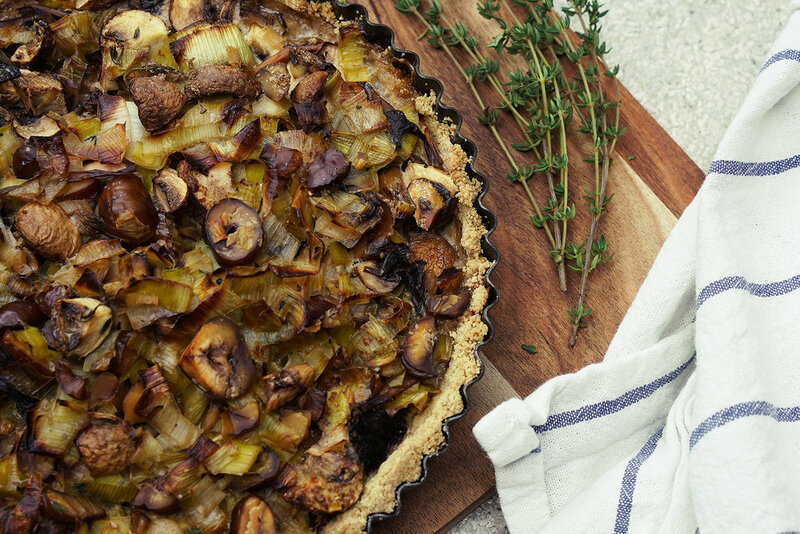 Whilst I am a fan of a homemade flavoursome nut or lentil loaf, this year we are breaking convention and making this delicious leek, mushroom and chestnut tart. A wholesome crust filled with a rich combination of festive flavours pairs beautifully with your classic roast vegetables. This is also really good cold so works well with leftovers on Boxing Day. Place the sunflower seeds and oats in a food processor and blend until fine. Add the flours, arrowroot, baking powder and salt and process to combine. Drizzle in the olive oil while the food processor is running then add the milk slowly until the mixture starts to come together. you can check this by turning off the food processor and feeling the mixture, it should hold together when pressed. Grease the tart tin then firmly press in the crust mixture. Prick the bottom with a fork and bake for 15 minutes. While the tart case is cooking, heat the oil in a large deep frying pan and saute the leeks for approx 5 minutes. Add the garlic and cook for a couple more minutes then add the thyme and cook for another minute. Add the mushrooms and chestnuts to the pan and cook for approx 5 more minutes until softened. Add the sherry or stock and allow to cook off for a few minutes. Stir through the creme fraiche to coat the veg then add the flaxseed and stir well. Once the tart crust is cooked remove from the oven and pour in the filling. Bake for a further 25-30 minutes then serve while hot or leave to cool completely. I hope you enjoy this alternative for a festive lunch, do let me know if you try this recipe and how you get on. Cooking and Eating with the Seasons. Transitioning to a vegan diet, a family approach.